The intrigue on the brittle pages of this 1930s radio script reaches beyond the suspenseful plot line. What does J. Edgar Hoover and the FBI have to do with this radio script? And how accurate are the events in the play? History Detectives consults with a radio historian in Merrick, NY, digs up background with an historian at FBI headquarters in Washington, DC and talks with a J. Edgar Hoover biographer who helps to connect the dots. 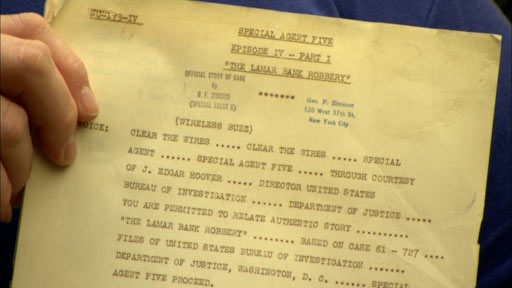 View the script for Special Agent Five, Episode IV, Part 1: "The Lamar Bank Robbery". Also with Gwen Wright Revolutionary War Poem How did this poem, written by an American prisoner in England in 1780 end up in Oregon 200 years later? Also with Gwen Wright Women's Suffrage Painting What role did this watercolor painting play in securing women the right to vote? Also with Gwen Wright Rebel Whiskey Flask Is this flask a relic from the historic "Whiskey Rebellion" of 1794?